Big name bands like Take That and Oasis are leading a boom in gig ticket sales, with UK stadium shows selling in record time despite the credit crunch. Take That are expected to sell 700,000 tickets on Friday for their 2009 tour, a week after 500,000 tickets to see Oasis were snapped up in six hours. 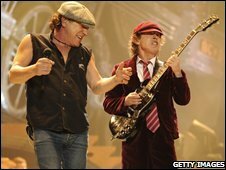 AC/DC, Metallica and The Killers have also sold out UK shows in recent weeks. But while massive stars thrive, there are fears that a recession could hit tours by small and middle-ranking acts. Take That's promoters SJM said the pop band's tour was the fastest-selling in UK history. "It's totally unprecedented," SJM managing director Simon Moran told BBC News. "In times of economic downturn, to sell £35m of tickets in one day for a tour is good for the economy, I would have thought," he said. Tickets for their 14 stadium shows - including four nights at Wembley Stadium - cost between £45 and £65 each. By 1530 GMT, only five of the dates had tickets left. According to SJM, the record of fastest-selling tour was only broken a week ago by Oasis, another of their bands. "Both artists are just very popular and careful with the ticket price," Mr Moran said. "Not all live music is doing good. But if it's the right artist and the right ticket price and the right event, people want to be entertained. "But there's plenty of what we're doing that's not doing that good, I can tell you." Meanwhile, virtually all dates on UK arena tours by Metallica and The Killers are now sold out. AC/DC sold 60,000 tickets in 40 minutes two weeks ago, while Depeche Mode sold out the O2 Arena in London in half an hour. Stuart Galbraith, who runs promotion company Kilimanjaro Live, said: "If you're AC/DC, Take That, Oasis or Metallica then it's very, very good." The live music scene had traditionally held up well in tough economic times, he said - but fans are still likely to cut back on gigs. "Rather than someone going out six times a week, a month or a year, you're going to see people going out three or four times. "So in that respect I think the strong tours with the strong artists will get stronger, and the weaker ones will get weaker." Speaking at the MusExpo music conference in London earlier this week, Mr Galbraith, former managing director of promoter Live Nation, said small gigs in pubs and clubs had seen a "marginal decrease". "But the real killing field area will be mid-range, where I think we're going to see some very, very severe issues," he said. Harvey Goldsmith, who has promoted shows by The Rolling Stones, The Who and Bruce Springsteen, as well as Live Aid, said the live music scene was healthy overall. "It's had an unprecedented growth over the last three or four years," he said. "In previous crises when the financial market has been in a complete mess, the live business has absolutely thrived because people just get fed up with reading bad news all day long. "They just want to go out, and I think the live industry will carry on and I think it should do very well. "The difficulty is that there's a gulf between the big acts who are pulling out every penny they can and don't care, and the newer bands who are trying to break through, who are struggling." There was a large number of acts in the middle who had been unable to make the step up to arena or stadium status, he added. "The big acts are there, they're not going anywhere. The difficulty is that middle market. That area is very, very price sensitive." That middle market comprises acts that tour too often or have struggled to reach superstar status. 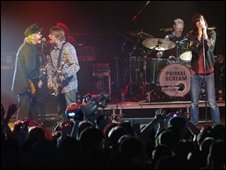 Sheryl Crow and Primal Scream have been cited as examples. "People will still spend the big money on A-list acts, but the ones slightly down the chain are beginning to suffer," Music Week magazine contributing editor Gordon Masson said. "The live industry has had such a good time over the past couple of years that it's going to have a little bit of a downturn no matter what. "With the credit crunch, everybody's sitting and hoping that things will work out OK.
"The fact that big shows are selling looks great for the industry but further down the chain there might be repercussions."